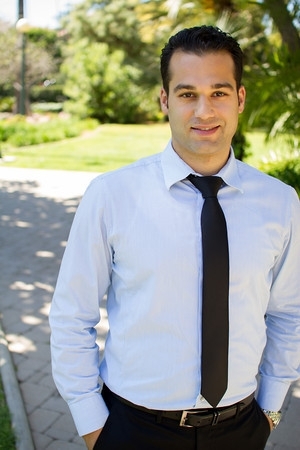 While attending the University of California, at Santa Barbara, Dr. Mahtaban suffered a horrific back injury one year prior to receiving his Bachelor of Arts Degree, which rendered him virtually handicapped. This experience led to Dr. Mahtaban’s decision to alter his career path, and ultimately devote his life to healthcare. While desperately seeking the help of western medicine, Dr. Mahtaban was surprised to discover, that at the youthful age of 21, all medical professionals who examined him, recommended surgery and pain medication to “solve” his problem. Unwilling to accept the risks involved with surgical procedures and the side effects of long term medication, Dr. Mahtaban continued his search for the cure. During his search, Dr. Mahtaban discovered the holistic paradigm of chiropractic. While receiving chiropractic treatment for his pain, Dr. Mahtaban ultimately gained a deep belief and understanding that one’s source of pain may not be one’s cause of pain. This realization altered his outlook on healthcare and also led him to full recovery. As a result, Dr. Mahtaban dedicated his life to the profession of chiropractic. Dr. Mahtaban is a product of the intensive 4 year Doctorate program at Cleveland Chiropractic College in Los Angeles, a school highly regarded for its curriculum that strikes a balance between chiropractic philosophy and scientific basis. Dr. Mahtaban believes in correcting the cause of the problem rather than merely relieving the symptoms of pain. Therefore, each patient is evaluated based on his/her particular symptoms and is provided a course of care that is specifically tailored for that patient. Dr. Mahtaban is gifted in diagnosing abnormal motor control patterns in each patient and subsequently correcting these patterns, resulting in patients who are pain free. In addition to this unique and specialized approach, Dr. Mahtaban practices collaboratively with other types of healthcare providers, in order to give each patient the proper resources in order to become pain free. The techniques utilized by Dr. Mahtaban include: Spinal manipulative therapy, soft tissue therapy, Instrument assisted soft tissue therapy, motion palpation, post isometric relaxation (PIR), Manual Release technique (MRT), Activator, Kinesiology taping, postural screening, gait assessment, physiotherapy, and electro-stimulation.